Sixteen years ago this week, 77 U.S. senators and 296 members of the House of Representatives gave President George W. Bush the authority to wage war in Iraq. That monumental vote enabled what is arguably the biggest strategic foreign policy blunder in American history, needlessly killing hundreds of thousands and costing trillions of dollars. To this day, the United States is still militarily engaged in Iraq and Syria, dealing with the continued fallout of Bush’s decision to invade back in 2003. For decades to come, the United States will spend tens, if not hundreds, of billions of dollars caring for American service members wounded both mentally and physically in that conflict. If you think the U.S. government learned its lesson from this tragedy, think again. If an administration again pounds the drums for war and the media reacted as they did [during the run-up to the Iraq war], without serious thought, with just a visceral emotional response rather than thinking critically and seriously and responsibly, I don’t think what happened in Iraq will unfortunately matter very much. I wish I could say to you something else. Well it just so happens that an administration is pounding the war drums again, and the media is playing right along. Team Trump showed its hand in the early days of the administration when then-National Security Advisor Michael Flynn randomly stormed into the White House press room to put Iran “on notice” (for what, it was unclear, but in any event, Iran was on notice). Soon after, the Trump administration began its quest to dismantle the Obama administration’s legacy of working through differences with Iran diplomatically and to put the United States back on the path to war. While Trump began signaling his desire to leave the historic nuclear deal, administration officials started dialing up the bellicose rhetoric. Later that year, then-CIA Director Mike Pompeo pushed the baseless narrative that Iran is in cahoots with al-Qaeda. U.S. Ambassador to the UN Nikki Haley later put on a flashy show accusing Iran, without evidence, of violating UN resolutions in Yemen. That episode led one former Bush administration official involved in selling the Iraq War to sound the alarm that Team Trump was applying the same approach to Iran. Trump then dismissed two senior officials—Secretary of State Rex Tillerson and Flynn’s successor, H.R. McMaster—who favored remaining in the Iran nuclear deal, and replaced them with uber Iran hawks Pompeo and John Bolton, both of whom hated the agreement and have pushed for war with Iran. After Trump finally announced that the United States would violate the deal and reimpose sanctions, Pompeo again went on the offensive in a series of speeches outliningwhat everyone (even the right wing) knows but Trump officials won’t say outright: a policy of regime change in Iran. Let’s not underestimate the impact of withdrawing from the Iran deal. The agreement is currently on life support. If the Europeans can’t make it worthwhile for the Iranians to stay in it once U.S. oil sanctions go into effect this November, the Iran deal is likely dead, leaving Iran free to restart its nuclear program and raising the prospect for war. But the last couple weeks have been particularly alarming. 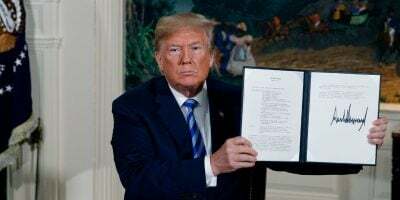 Trump, Pompeo, and Bolton used their spotlights on the world stage last month during the UN General Assembly and a U.S.-hosted UN Security Council meeting to lash out at Iran “with unusual venom,” as the Associated Press put it. The administration is also increasing the likelihood of military confrontation with Iran in the region, announcing plans to keep U.S. troops in Syria to counter Iranian forces and, more recently, blaming Iran for attacks on U.S. diplomatic facilities in Iraq. On the media side, there are some differences between now and the run-up to the Iraq War. For example, the Bush administration’s case for war was a conversation that started shortly after 9/11 and was a primary media topic for the next year and a half. The country was still reeling in the aftermath of the attacks. The context is different today, but the media is still making the same mistakes. First, the Trump administration’s sharp focus on Iran has been covered here and there but it’s by no means the topic of conversation on a day-to-day basis. That’s largely because there’s just so much distraction, whether from the Mueller investigation, the many destructive policy decisions made by this White House, or just the ongoing ridiculousness of Trump himself. Second, media outlets are beating the Iran war drums themselves now too, particularly Fox News and right-wing media. But there’s a mainstream media element too. Iran hawk columnists masquerading as hard-news reporters hold high perches at the some of the nation’s most elite media outlets, while others have promoted baseless claims about the Iran deal to help lay the groundwork for Trump to withdraw. And those who advocated for war in Iraq are getting plenty of air time these days to talk about confronting Iran. On that front, there’s also a newer game in town. The Foundation for the Defense of Democracies, while not a player during the run-up to the Iraq War, is the most prominent and influential hawkish “think tank” in DC pushing for war and regime change in Iran. Whether in the op-ed pages of the nation’s most widely read newspapers, on major TV and radio news, or even in newer media puff pieces, mainstream outlets regularly give FDD’s staffers wide latitude to trash the Iran deal or make the case for war and/or regime change. And they’re usually presented as neutral experts and analysts without giving any sense of what FDD is actually pushing for. They sometimes even get happy birthday wishes. Just last week, mainstream outlets largely ignored the fact that Pompeo and Bolton were delivering their hostile Iran speeches before a shady but influential and well-funded group with ties to Gulf countries urging a more aggressive U.S. approach to Iran. This march to war with Iran is happening. Because of the chaos that is this Donald Trump presidency, it’s not getting the widespread attention it needs. Indeed, as if reading right from the Iraq-War playbook, and without offering any evidence, Pompeo said last week he has “solid” intelligence that Iran is responsible for attacks on Americans in the Middle East. “We can see the hand of the Ayatollah and his henchmen supporting these attacks on the United States,” he said. Given the widespread media attention on the Supreme Court nomination circus, Pompeo’s remarks barely made a blip in the national media. Ben Armbruster is the communications director for Win Without War and previously served as national security editor at ThinkProgress.